HMH and Math Solutions offer customized professional learning services and help prepare teachers and students for success in mathematics. 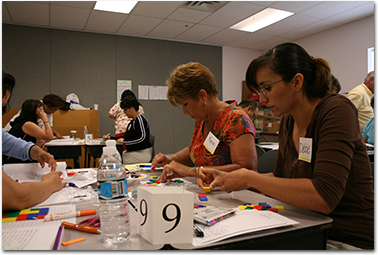 Do The Math, Do The Math Now!, and Math Reads were designed to support teachers in both understanding and delivering effective math instruction. Professional learning is embedded throughout the Teacher Guides and Lesson Cards to maximize the benefits of the instructional programs and to provide continued opportunities for professional growth. Supporting Instruction provides tips for addressing common student misconceptions. Connecting to Mathematical Concepts explains how content strategies, activities, and concepts are integral to higher-level understanding and success in algebra. Language and Development provides ways to support English language learners. Mathematics Background provides content support to explain a concept further or relate a concept to other mathematical topics. Ideas for Differentiation provides strategies for working with students who need additional support, as well as for continuing to support students who are ready for additional challenges. The embedded teaching support in each lesson helps teachers meet individual student needs and provides guidance for effective and easily managed teaching. The included professional resource from Math Solutions Publications provides mathematical and pedagogical support. Vignettes of actual lessons provide valuable teaching guidance and help bring the instruction to life.